Back in September, I had posted about lighting for wall mounted carpets, however that post seems to have vanished. 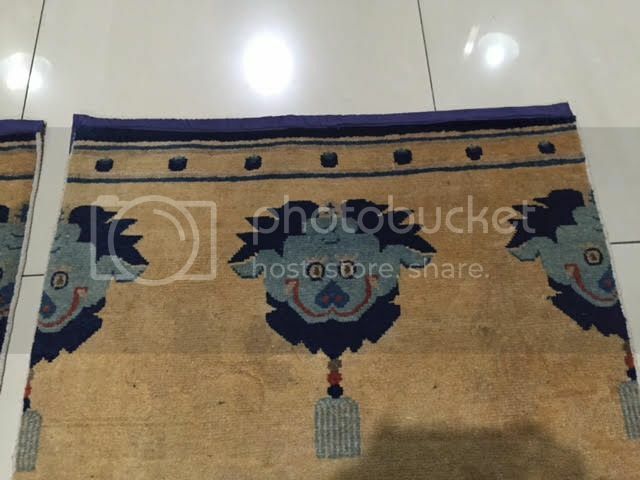 At the time I was looking to light a set of pillar rugs. What I eventually went with was this recessed light. It's small enough to be inconspicuous and has a gimbal which allows a more precise direction of light. It is Insulation Contact Rated and is Air Sealed, both of which are electrical code requirements for the space where I was putting it. Not too many (or any) other lights meet that list of qualifications. Thought this would be helpful for those the same. Pics eventually to follow, however I no longer have photos stored online, so maybe not. Before. Even with the overhead lights on, and with daylight through the windows, the carpets look dim. After: Recessed lighting installed. Carpets are much improved. Currently running a 35w equivalent LED, which may even be too bright at about 500 lumens. May down-lumen to 20w equivalent LED which would be about 350 Lumen, but first I'm going to live with it for a while. Last edited by Jeff Sun; December 10th, 2015 at 02:19 AM. A pair of lovely rugs, Jeff. Thanks Marvin. Mongolian. Over 100 years old. Yes, a sweet pair, nicely displayed. I'm not asking you to dismantle your situation, but if it is convenient for you to post any detail shots, including that ever-popular 'clear shot of the back,' I know they would be appreciated. 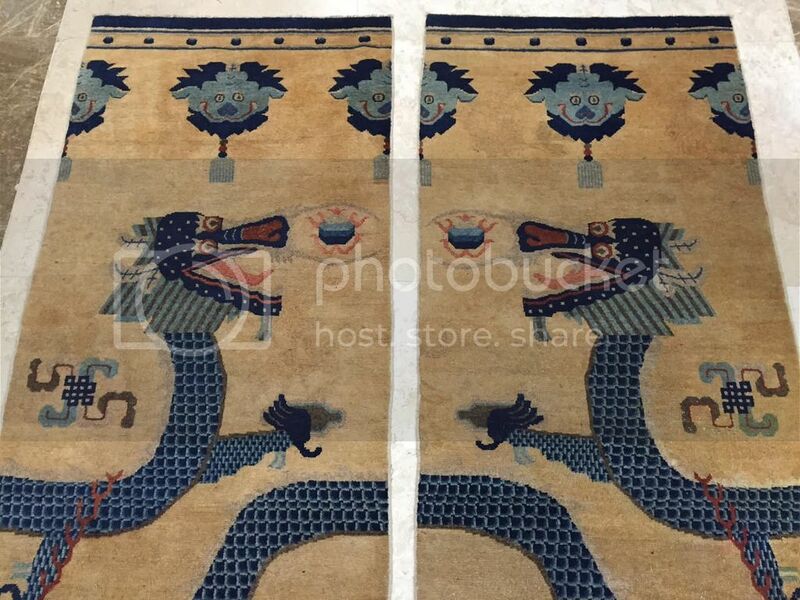 Since I frequently get questions from customers about proper and safe levels of lighting for textiles, a while back I called Jim Henderson, a lighting expert and also rug collector for advice. He gave me permission to post a couple of his articles on my website, so I’ll pass them on to you all. A few surprising things are included. 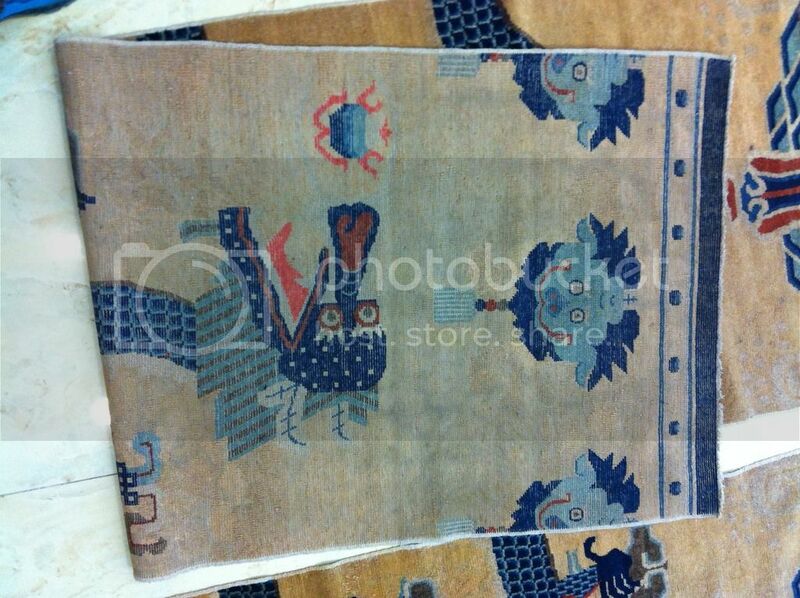 The first is a piece from an old ORIENTAL RUG REVIEW. A link to a second, more technical piece, appears at the end of that article. He said that overall recommendations have not changed with the new LED equipment now available. 1. Lower UV output means less fading. 2. Potentially, lower UV also means fewer insects. Not that UV light is everything, as the articles you posted point out, the focus on UV light can be considered an un-necessary complication, and it's role in degradation has been overplayed. However, less UV radiation can't be bad. On the downside, LEDs typically run at 3000K deg or brighter. Not the warmer 2700K of incandescent "soft white" bulbs. With ongoing switch away from incandescent and halogen, "warm" bulbs are tough to find. Indeed, I could find none that fit my fixtures. Just a clarification about color temperature. It's not a measure of brightness, but of color balance. A lower color temperature is "warmer" (more red), higher color temperature is "colder" (more blue). You are correct Steve, and I shouldn't have used "Bright". It was not my intent to say that 3000K+ bulbs shed more lumens. Generally the manufacturers do often refer to the whiter colored lights as "Bright White" or "Daylight". I just wanted to prevent confusion. The descriptors for various color temperatures can be confusing, as you note. If I'm having one of my increasingly rare lucid moments, sunlight is around 5000 degrees. An update: I swapped out the 35w equivalent LEDs for 20W equivalent LEDs today. Supposedly 200 lumens, which would be a big reduction, but I can barely tell. For anyone looking to duplicate what I did , here are the bulbs, which like the aforementioned fixtures, are conveniently available from Lowes. For textiles, prefer LEDs with a high color rendering index (CRI), which is a measure of the color accuracy of the light. Some of the better LEDs have a CRI in the low- to mid-90s, which is good enough to see color nuance through the full visible spectrum (especially deep reds, important for textiles and deficient/inaccurate in many light sources). Cheaper general-purpose LEDs are usually around CRI 80, good enough for utility lighting but not for color sensitive applications. FWIW Compact florescents are often in the 70s and almost totally deficient in deep reds. Also, textile lighting might easily benefit from installing a dimmer switch, so that you adjust the lighting. Most of the better LEDs are dimmable. Lowest-cost bulbs often aren't. Thanks, Steve, for your information. Most of us tend to not give much thought to accurate color rendition, unless we’re trying to produce reasonable photos of our pieces. Although fading and degradation of our textiles and rugs should be an obvious concern, few collectors seem to give this much serious thought. It is about all I can do to convince my customers to keep their pieces away from sunlight. 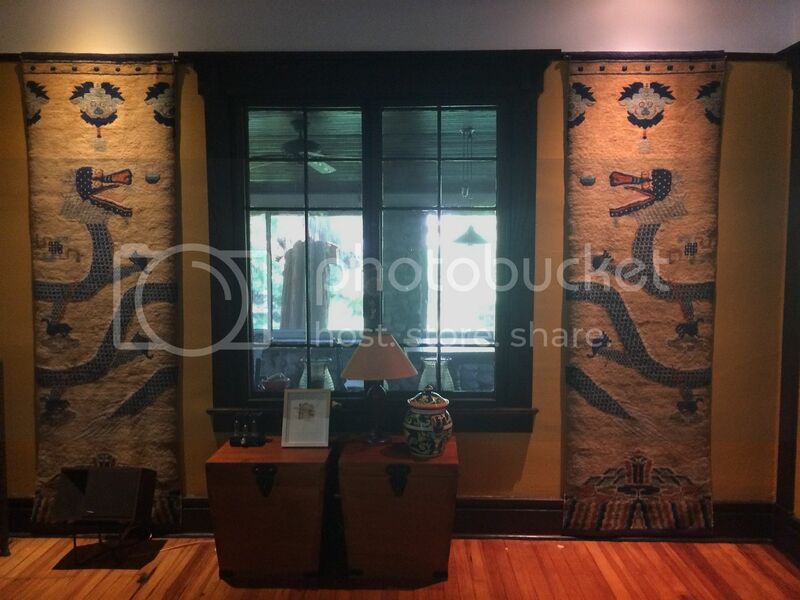 It is amazing how often folks write to me about needing a kilim for their "sunroom." 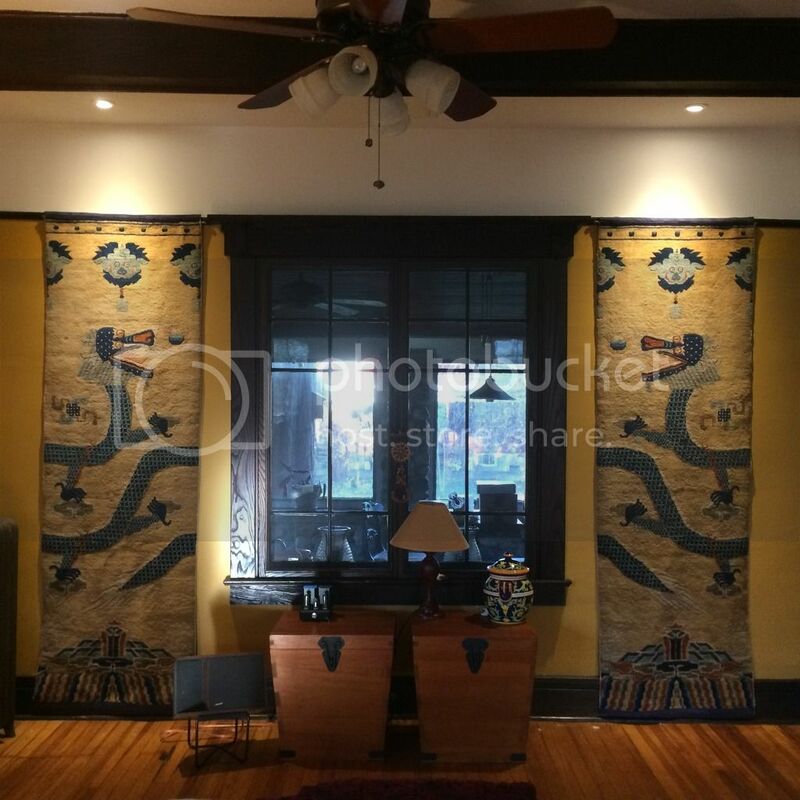 A few years ago I had a 19th century silk Indian embroidery hanging in my upstairs gallery in an area that got perhaps an hour of late afternoon sunlight. I wouldn’t have put a favorite piece in that spot and it was a textile I didn’t really like much. It was a difficult place to hang anything, so I wasn’t eager to rotate it. After a few months' time the colors didn’t seem to have been affected, but I was surprised to find that the silk had degraded so severely that it literally fell apart in shreds when one touched it. 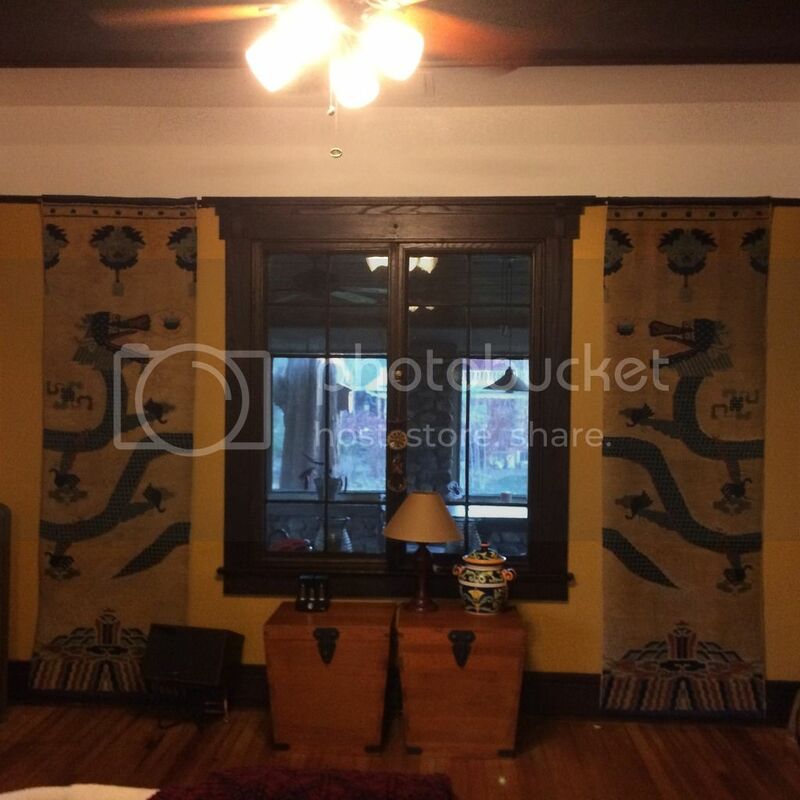 One friend has his favorite kimono—a delicate sheer hand painted piece--hanging across a south window and I can’t seem to convince him this isn’t a good idea. One particularly bad experience with fading involved a weaving of my own, for which I had dyed most of the wool yarns with good quality contemporary acid dyes. This weaving had won a purchase award in a local exhibition, and it then hung for a few years in a stairwell of our Atlanta Civic Auditorium. At one point they decided to move it to another spot, and so brought it to me to devise a different hanging mechanism. Well, I hadn’t seen the piece for perhaps five or six years, and I was shocked: The colors had changed drastically—nearly all faded significantly. To me it looked dreadful, and I felt humiliated that it had been hanging in public view for so long. The lighting in that space was provided by fluorescents. Other examples of fading that I routinely see: fade lines on textiles that have been sitting folded in stacks. For example, I frequently come across black tomesode kimonos with faded fold lines just an inch or so wide—the only part that was exposed. I’ve come across tapestries and embroideries with the same kind of localized disfiguration. So please, folks, be forewarned. Last edited by Marla Mallett; December 27th, 2015 at 01:12 AM. Marla, you're welcome. Most consumer LEDs emit very little UV light, so they're less likely to cause fading than (say) sunlight at the same levels. High CRI LEDs, because they're more accurate, tend to let people see well at slightly lower levels, also good. And the use of dimmers makes it easy to minimize light. I believe museums now often use LEDs as conservation-conscious display lighting. FWIW, I've believed that indigo has outstanding light fastness (the "fading" in jeans is abrasion), and madder is also excellent (if mordented). Pieces with lots of dark blue and dark red might be a bit safer under lights, and they're the ones that that tend to need light to "pop" in any case. I have a modern art rug that I found in Los Angeles, along with several paintings in an art studio that I manage, and have just made the switch from halogen to LED lighting. My motivation for the switch was mainly more efficient lighting, but It's assuring to learn that LEDs have lower UV emission. Thanks. I know there hasn't been activity on this post in months but I just signed up to this forum and wanted to comment my thanks for a clear post about lighting. I know to keep pieces out of the path of direct sunlight but had wondered about lighting, often opting for darkness or dim lighting at the expense of fully appreciating a carpet. It's great to read about LED lights as an imperfect though improved solution. 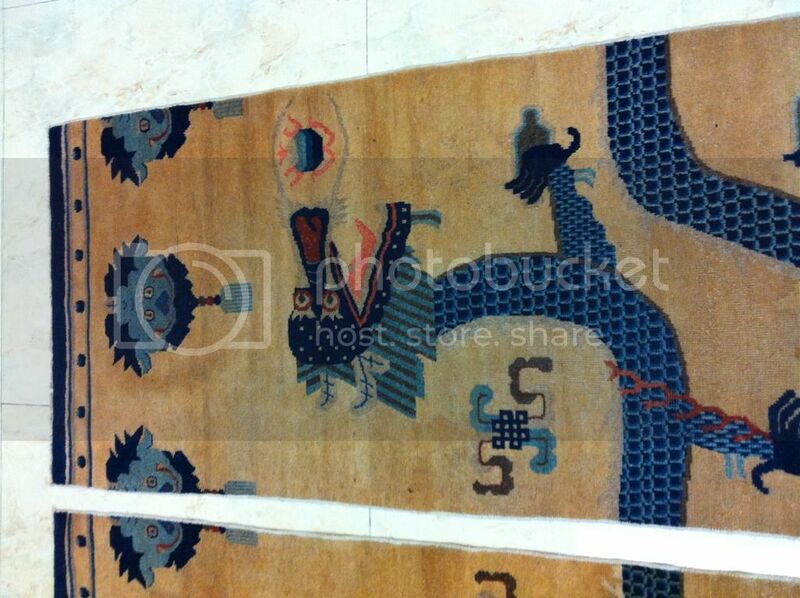 Also, to the OP, I love those carpets! The foo dogs (if I'm right in my interpretation?) are really interesting! 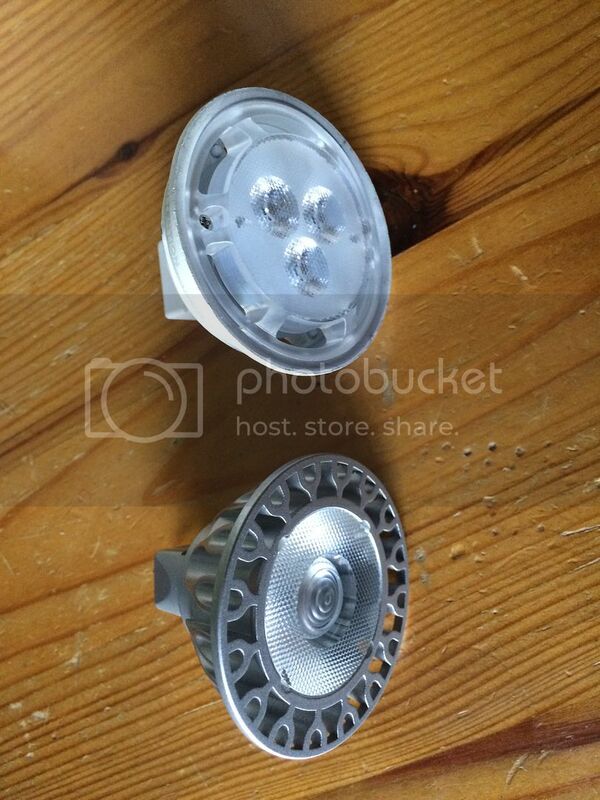 I recently updated the lighting from the Feit 3 watt, 3000K bulb to these Soraa 2700K bulbs. Ostensibly they have better color rendering: 95CRI vs 80CRI on the Feits. I thought might help to display the carpets to best advantage, as the reds are quite mediocre, being for the most part Logwood dyes, and could use an assist. And here is a side by side. 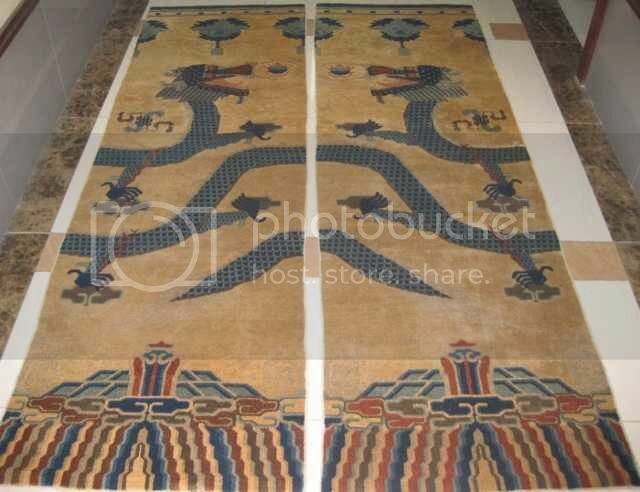 The carpet on the right is lit by the Soraa, the one on the left is lit by the Feit. Can you tell the difference? It is tough. Looking at them with the naked eye, the distinction was easier. Overall, my thought is that the slightly warmer Soraa look, well, warmer...but the reds still are quite mediocre. I suppose there is no making up for good dye. Last edited by Jeff Sun; September 9th, 2016 at 01:52 AM. On my Toshiba laptop I don't see any difference. On the LG TV/monitor of my home desktop, the left one is more yellow, with a little greenish tone, while the right one is more reddish with a bit of violet in it. That's what I see on my monitor, too.